Cacti come in huge variety of types and species and most gardeners can find easy Cacti or 'Cactus' plants that are easy to care for either in the garden or in pots or containers. 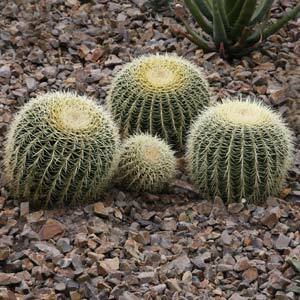 The Golden Barrel Cactus, pictured right is Echinocactus grusonii and can easily be grown indoors in a container. Reaching over 3ft (1m) in height they can make a wonderful architectural plant in the right surroundings. All cactus are succulents (however the reverse is not true) and most do require well drained soil, warmth and good light. And with literally 100s of species with enourmous variety you will be certain to find a plant that intrigues you. One of the most popular is the Orchid Cactus, these are the Epiphyllums and Epiphyllums oxypetalum or Night Blooning Cereus may not fit the typical image of a cactus, however it is widely grown on patios and hanging baskets across the UK. Growing cacti (cactus) plants outdoors in the UK does require a little research, even within species some plants are happier in cold climates than others. Growing cacti in raised beds with good drainage is essential in the UK as plants can survive the cold but only if the roots are well drained and dry. Aeonium, Echeveria, Echinocereus, Echinopsis, Epiphyllum or 'Orchid Cactus', Euporbia, Gymnocalycium, Haworthia, Hoya, Lithops or 'Living Stones' Lobivia, Mammillaria, Notocactus, Opuntia or 'Prickly Pear', Rebutia and Stapelia, Tephrocactus.